Hamburg connected - with connections to the whole world. Elneco Lagerei GmbH is a logistics and warehouse company managed in Hamburg that has been operating on the market for 14 years. Modern, well secured warehouse halls with more than 2,000 m² storage space and 10 unloading and loading points ensure a smooth flow every day. The focus is on Germany, China, Ukraine, Poland, Russia. ELNECO's excellent knowledge of Eastern Europe is also used by many of our customers to establish contacts or obtain initial information about their possibilities in Eastern Europe. 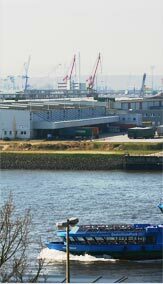 Our employees and our customers have been admiring our excellent location in the Hamburg free port. At the same time, however, it is also means an obligation to confirm the exceptional nature of this location by the exceptional to confirm the exceptional logation by achieving an exceptional performance by ELNECO.